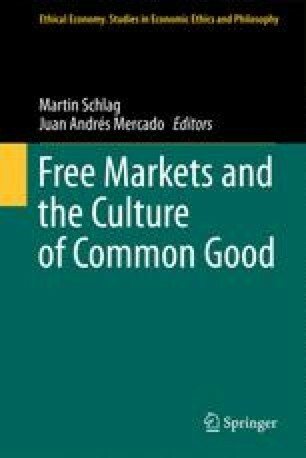 Russell Hittinger, professor at the University of Tulsa, USA, responds to Martin Rhonheimer’s paper by addressing some of its more provocative points as well as by elaborating an idea of the common good suitable to guarding a rightful autonomy of institutions and societies other than the state. In this article, Hittinger begins by focusing upon two of the more important elements found in Rhonheimer’s work: the practical rationality necessary in the interaction between state and market and Polanyi’s “double movement,” characterizing the conflict between these two players. While understanding that an economic utopia is unrealizable, the state must limit its “intervention” to restoring the rule of law. Upon this basis, the author then elaborates the principle of unity enshrined in the concept of the common good; oft misunderstood, this common good is destroyed when the state attempts to divide and distribute the common goods, which can only be shared or participated, therein.